Several patterns of hair loss can occur in lupus erythematosus (LE). Alopecias which show histological characteristics of LE are LE-specific, and include discoid LE (DLE), diffuse or patchy hair loss in acute LE, subacute cutaneous LE, and rarely tumid LE. Lupus hair in SLE is a poorly characterised entity and may be a form of telogen effluvium. Alopecia areata can coexist with LE and may mimic DLE. Non-lupus alopecias such as telogen effluvium and anagen effluvium have a myriad of causes which include disease flares, drugs and stress in the setting of LE. The latest validated Systemic Lupus International Collaborating Clinics classification criteria for SLE includes non-scarring alopecia as a criterion; therefore, recognising the aetiology of hair loss in the setting of LE is crucial in classifying a patient to have systemic disease. Hair loss is a frequent occurrence in SLE and is present in more than half of the patients at some point during the course of the disease.8 11–14 Although several patterns of hair loss can exist in the setting of SLE, the aetiology is not always specific to LE (box 1). Determining whether alopecia is inherent to LE or just coincidental to LE is crucial because it has been included in several classification systems for SLE (table 1), including the latest Systemic Lupus International Collaborating Clinics (SLICC) classification criteria.1 Non-scarring alopecia, in particular, has been incorporated in the SLICC criteria because its specificity to SLE is high (95.7) in the derivation sample, and it met the standards of clinical consensus among experts.1 2 Non-scarring alopecia is clinically defined by the SLICC as diffuse thinning and fragility of the hair in the absence of other causes.1 Several processes that result in non-scarring alopecia must therefore be ruled out before attributing hair loss to LE (boxes 1 and 2). *Non-scarring in its early stage. Acute diffuse and total alopecia areata. In this paper, we discuss an approach to recognising the different causes of hair loss that occur in LE and their differential diagnoses. The categorisation we employ is largely based on how scalp biopsy features are consistent with the diagnosis of LE. We also expand on the alternate diagnoses of non-scarring alopecia in LE. Certain points in the history and physical exam (which may necessitate the use of dermoscopy) can, in the majority of cases, lead the physician to make a confident diagnosis. However, non-scarring alopecia in SLE has a wide range of differential diagnoses (boxes 1 and 2) which can challenge a physician’s clinical acumen. In a patient suspected to have SLE but with an unclear aetiology of hair loss, working closely with dermatologists and performance of ancillary tests such as a scalp biopsy, direct immunofluorescence (DIF) and/or serological markers may be warranted. 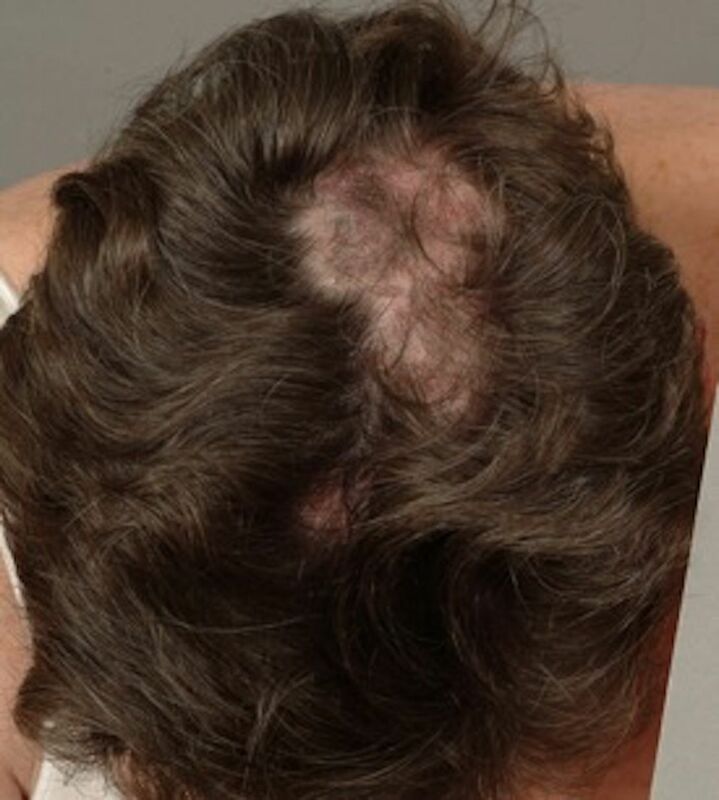 LE-specific alopecia is classically exemplified by scalp discoid lupus erythematosus (DLE), which is typically scarring.13–16 Several non-scarring forms of hair loss such as lupus hair, alopecia areata and telogen/anagen effluvium do not display biopsy features of LE and are considered either LE non-specific or just coincidental with LE.14–16 Subacute cutaneous lupus erythematosus (SCLE), tumid LE and acute LE display histopathological features consistent with LE and are lupus-specific alopecias.17–24 However, attribution is not always straightforward because LE-specific alopecias can coexist with the more common causes of hair loss and can possess similar clinical features.14 19 25–27 Moreover, it should be kept in mind that certain cutaneous findings on the scalp (DLE, SCLE, diffuse non-scarring hair loss due to acute LE) are distinct items in the classification criteria for SLE and may count as separate items in fulfilling the criteria (table 1). (A) Discoid lupus erythematosus. An atrophic porcelain-white plaque on the vertex with areas of erythema, scale, dyspigmentation on the periphery. (B) Dermoscopy of discoid lupus erythematosus. 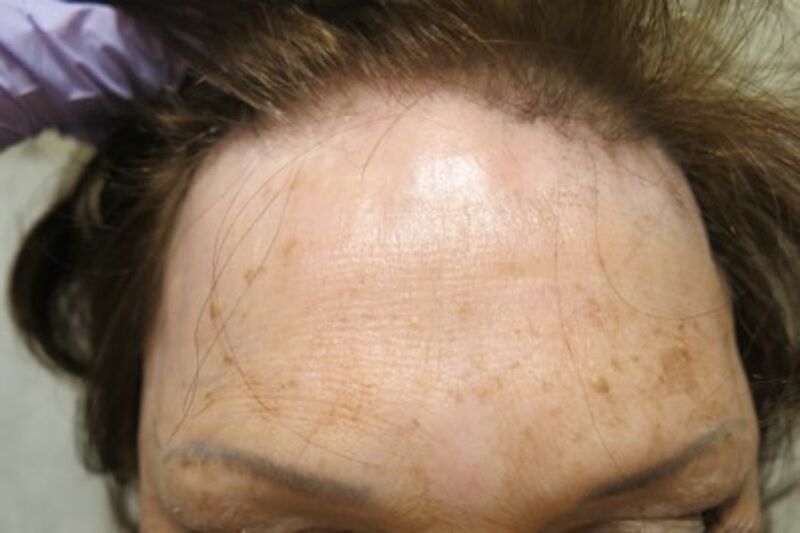 Loss of follicular ostia, areas of follicular plugging, dyspigmentation and pinpoint follicular red dots. Frontal fibrosing alopecia. Receding hairline on the frontal scalp, with bilateral loss of eyebrows. Diffuse hair loss in a patient with acute lupus erythematosus. Alopecia resembles patterned hair loss, but occurs in the setting of a lupus erythematosus flare. Although SCLE does not typically involve the head and neck region,63 there have been reports of SCLE affecting the scalp and resulting in patchy hair loss.21 22 These lesions are usually non-scarring, and the morphology can be polycyclic, annular or psoriasiform with thick adherent scale (figure 4).21 22 Histopathology showing psoriasiform hyperplasia with a perivascular mononuclear cell infiltrate can be similar to psoriasis; however, a positive lupus band test favours the diagnosis of SCLE.22 Distinguishing SCLE from early DLE can be challenging. Subacute cutaneous lupus erythematosus. Non-scarring, scaly erythematous plaques, with similar papulosquamous lesions on the body (not depicted). It was Armas-Cruz et al 68 who first described the appearance of dry and fragile short hairs on the frontal hairline of patients with lupus and coined the term ‘lupus hair’ because this sign is so striking that it can suggest the diagnosis of SLE even by just observing a patient from afar (figure 5). The prevalence in a certain cohort of patients with SLE can range from 5% to 30%, and it is found predominantly in women with chronically active SLE.15 24 69 This condition is postulated to be either due to hair shaft breakage68 or to retarded hair growth,15 although a trichogram performed on a few cases showing pointed hairs supports the latter.69 The presence of this type of hair loss in a patient with SLE suggests disease activity or exacerbation,15 68 69 oftentimes improving after the LE flare subsides.14 Growth of fine depigmented hairs can be seen in some patients during the recovery phase.69 There is no formal consensus as to what the clinical definition of ‘lupus hair’ should be. Some consider ‘lupus hair’ to be a variant of telogen effluvium,14 15 whereas others characterise it as vellus hairs on the anterior scalp.24 Moreover, there are no trichoscopic or histopathological features of this clinical sign available in the literature. Lupus hair. Fine, brittle hairs on the frontal scalp in a patient with SLE. Alopecia areata. Non-inflammatory circular patch of hair loss on the parietal scalp. 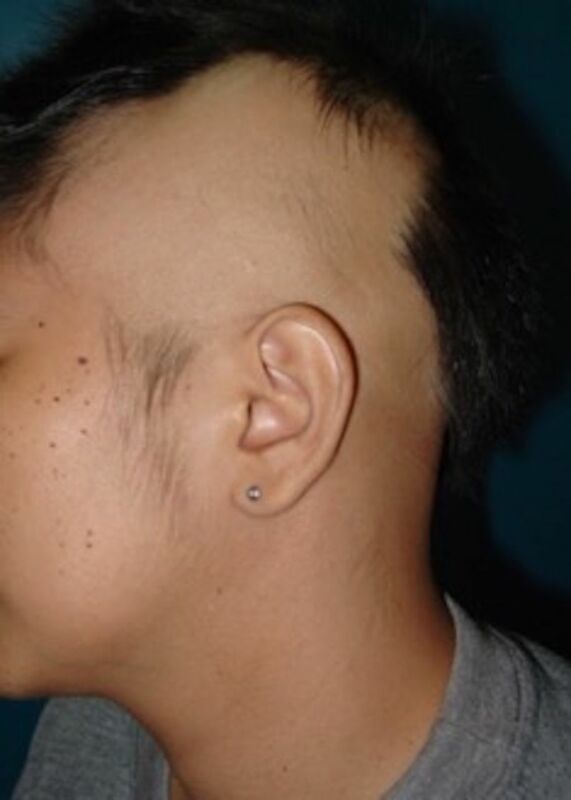 Ophiasis is more known as a rare form of alopecia areata in which the hairless region follows a band-like distribution along the parieto-temporo-occipital region.17 74 In LE, it can be both scarring or non-scarring.14 Although it is regarded as one of the major features that portend a poor prognosis in AA,62 there are no available data to say this risk is the same as for those with LE. 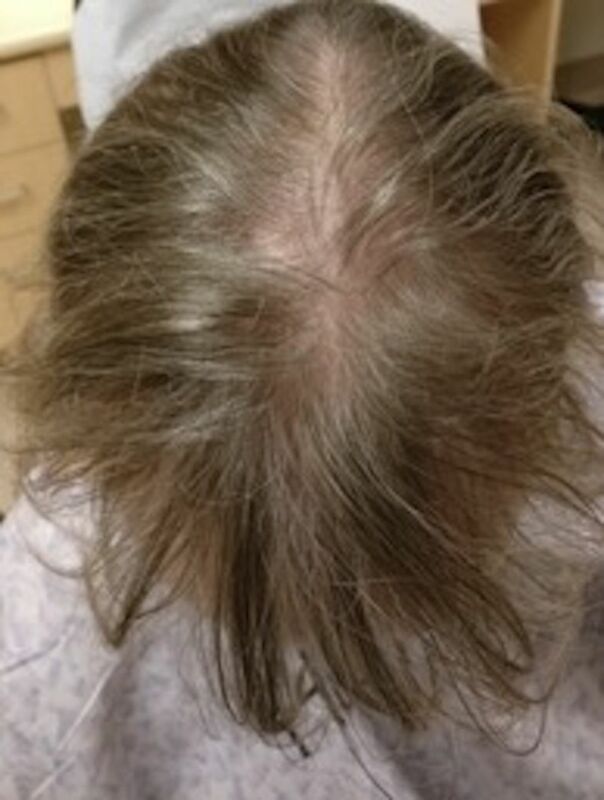 Patterned hair loss in a female patient. 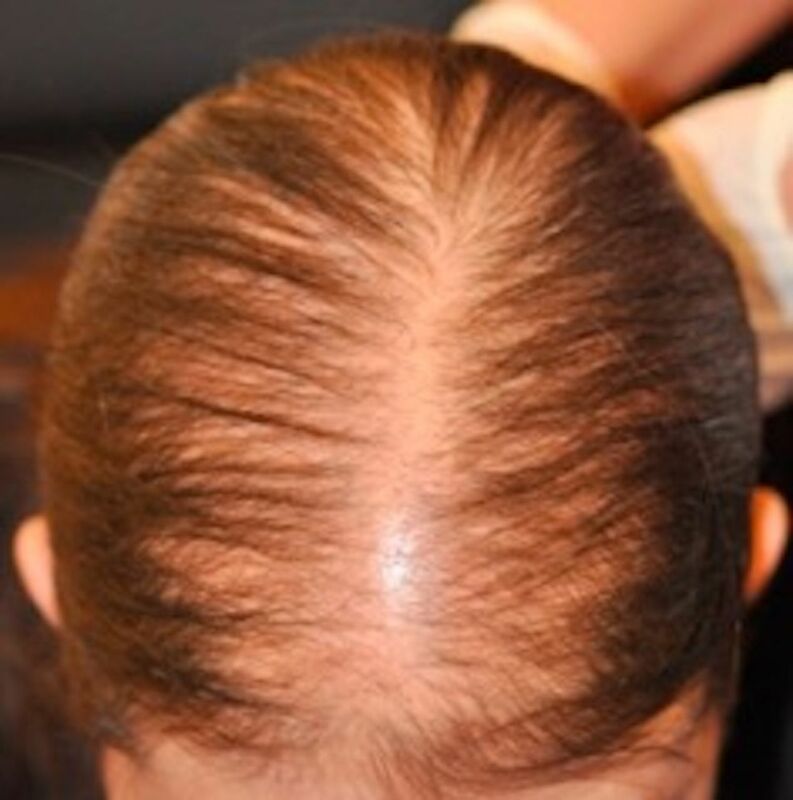 Alopecia resembles a ‘Christmas tree’ configuration on the crown. Hair loss in LE can be LE-specific, non-specific to LE or coincidental with LE. Scalp DLE, the classic case of LE-specific hair loss, has a high incidence of scarring which negatively impacts the quality of life of these patients. Non-scarring alopecias can also display histopathological changes that are specific to LE. Diffuse non-scarring alopecias generally reflect the underlying systemic activity in LE. Both scarring and non-scarring alopecias can have overlapping features and can resemble non-LE causes of hair loss. The diagnosis of alopecia occurring in the setting of LE has implications on the classification of SLE. In cases where the underlying process is unclear, working with dermatologists and utilisation of dermoscopic, histopathological, immunopathological and serological data may be necessary.
. Autoimmune diseases and therapeutic approaches 2015 ACR / SLICC revised criteria for diagnosis of systemic lupus erythematosus. 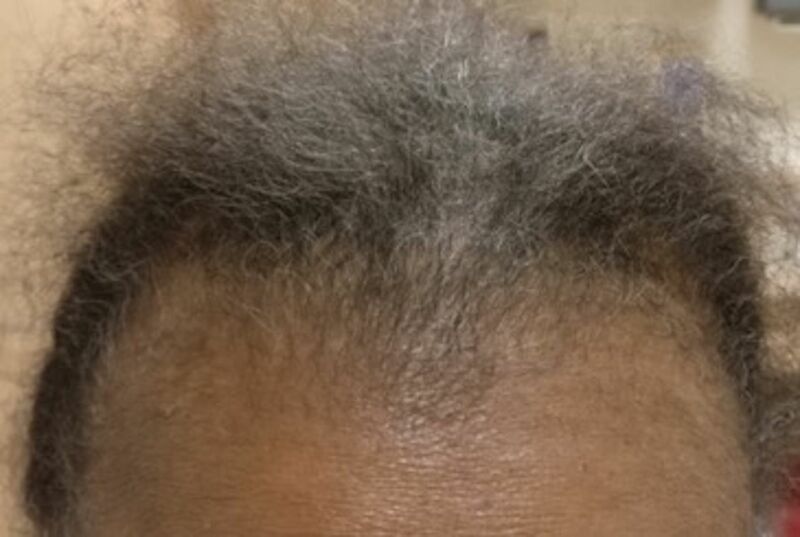 2015;2:2–5.
. Alopecia in systemic lupus erythematosus. Relation to disease manifestations. J Rheumatol 1991;18:1185–6.
. Dermatological manifestations - are they specific markers for systemic involvement in SLE? J Evol Med Dent Sci 2015;4:15749–55.
. Hair loss in autoimmune systemic diseases. G Ital Dermatol Venereol 2014;149:79–81.
. Hair loss in lupus erythematosus. In: encyclopedia of medical immunology - autoimmune diseases. New York: Springer Science + Business Media, 2014: 455–9.
. Lupus erythematosus tumidus of the scalp masquerading as alopecia areata. Cutis 2017;99:22–4.
. Subacute cutaneous lupus erythematosus. Arch Dermatol 1986;122:170–6.
. Subacute cutaneous lupus erythematosus (SCLE) presenting in childhood. Dermatol Online J 2005;11:27.
. Diseases of the Skin Appendages. Andrews’ Diseases of the Skin. 12th edn. Elsevier, 2011: 741–82.
. Dermoscopy patterns of cicatricial alopecia resulting from discoid lupus erythematosus and lichen planopilaris. An Bras Dermatol 2010;85:179–83.
. Martins da Costa Marques ER, Noriega L. Frontal fibrosing alopecia coexisting with lupus erythematosus: poor response to hydroxychloroquine. Ski Appendage Disord 2016;2:162–5.
. Clinical picture, histopathology, and pathogenesis. J Am Acad Dermatol 2010;62:177–88.
. Linear lupus panniculitis of the scalp presenting as alopecia along Blaschko’s lines: a distinct variant of lupus panniculitis in East Asians. J Dermatol 2013;39:e93.
. Ophiasis; report of two cases. AMA Arch Derm Syphilol 1954;70:812–4. Contributors JSSC and VPW have contributed equally to the manuscript. VPW is responsible for the overall content as guarantor. Funding This work was supported by the US Department of Veterans Affairs (Veterans Health Administration, Office of Research and Development and Biomedical Laboratory Research and Development) and NIH RO1AR071653 (VPW). Data statement There are no unpublished data available for this literature review.